Getting our dose of Omega 3s is important and that’s why I try to cook fish at least once a week. Here’s another good simple way from the I Can’t Cook Book. Slice some lemon wedges and and arrange on baking sheet. 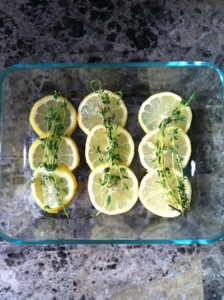 Top with thyme sprigs, just like in the picture. 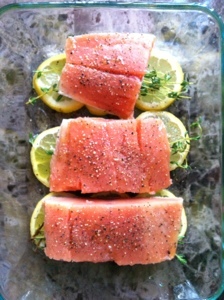 Place the salmon on top and bake. @350 for 20-25 mins or until fish is fully cooked.